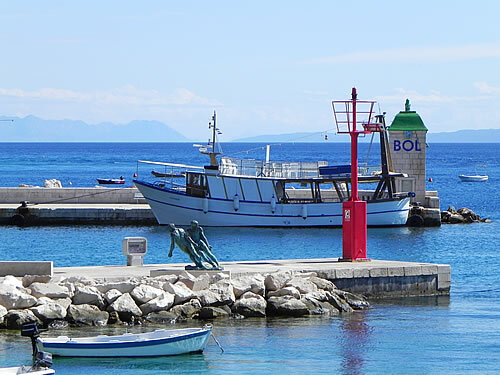 Visiting Bol on the neighbouring island of Brač is an easy day trip from Jelsa. The two towns practically face each other across the narrow channel of sea dividing the islands. 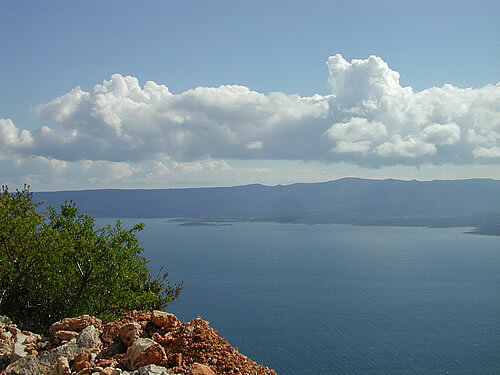 Most visitors to Bol will be heading for the iconic Zlatni Rat beach, or Golden Horn in English. That is indeed an impressively beautiful sight, but to my mind better enjoyed out of season when you can have it to yourself! But there are many reasons to visit Bol – food, art and wine to name my favourite three! This pretty little town is tucked into the narrow south coast strip of the massive mountain block that is Brač. The way in by road is a series of switchbacks from the top that drops you 3,000 feet with some pretty spectacular views across to Hvar, looking very green and low from there! From Jelsa, you have two choices to get to Bol. Jadrolinija’s scheduled daily catamaran service to Split calls in at Bol in both directions, and is fast and comfortable. Trouble is, it departs Jelsa at 6:30am, which leaves you in Bol at 7am which is a tad early for most things! The more civilised option is to take one of the excursion boats departing around 9:30 or 10am, and returning in the late afternoon. The Andreja comes from Vrboska, where you can pick it up at 8:15am. Weather permitting, of course. It brings to mind that silly volcano in Las Vegas that erupts on the hour every hour – except in inclement weather! Anyway, there being a quorum (minimum 10 paying passengers for the boat to go) , and no bura that morning, we set out in sunshine for Bol. On the boat, we saw a poster for Starigrojski Paprejok (Stari Grad pepper-cakes). Turns that our crew, Branka Visković, also runs a separate business making the traditional spiced pepper-cakes that are becoming so popular as souvenirs. They’re made from a centuries-old recipe in shapes such as amphorae, fish, hearts, clover leaves and lovingly hand decorated. Bol is a lovely little town. 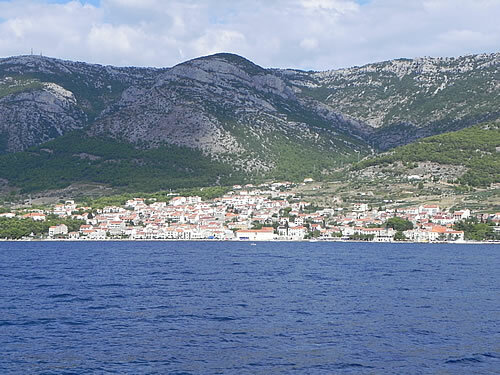 Aside from the big hotels and the sports complex out towards Zlatni Rat, it’s a compact center of red-roofed traditional stone houses, with a tiny harbour. The historical wine cooperative building is impressive as we sail in – of that more later. 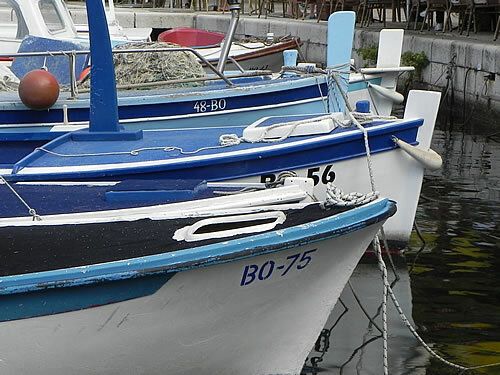 The boats in the harbour all seem to be in in various shades of blue for a very harmonious effect. This would be a lovely place to sit and paint, I’ll have to come back and do that one day! Our morning appointment is at the Bol Art Gallery. 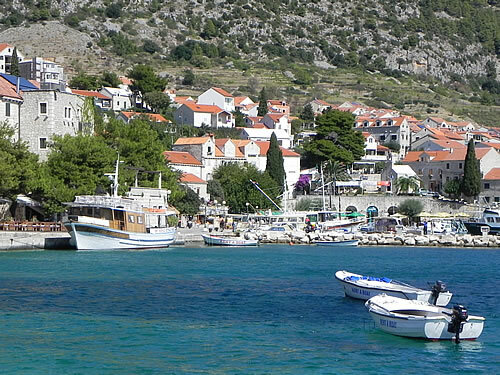 Brač has a tradition of stone-working and sculpture, and some very good artists have lived and worked on the island. There appears to be quite an artist community here, and this is a real gallery with a permanent collection of local art. 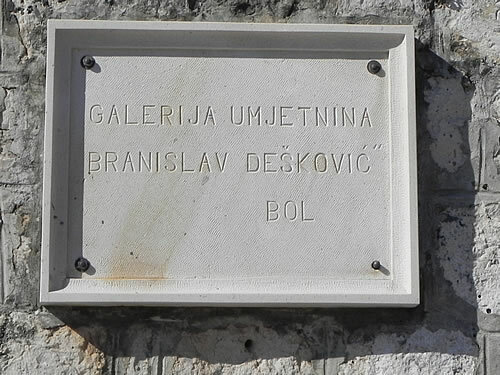 Their most famous local sculptor was Branislav Dešković, and the gallery is named after him. I was also keen to see what works they have of Ignjat Job, who lived on this island in the 1930s. 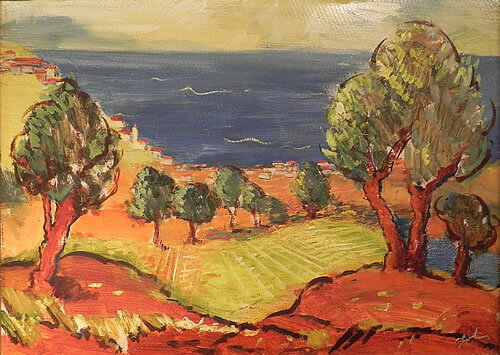 He’s one of my favourite Croatian artists, as he loved colour too! The gallery is right on the waterfront, in a converted palace, by the looks of it. It’s lovely, and we have a fun morning browsing the art – both contemporary exhibits and the collection of modern art. For more art, have a look at my separate post on the Art Gallery “Branislav Dešković” in Bol. 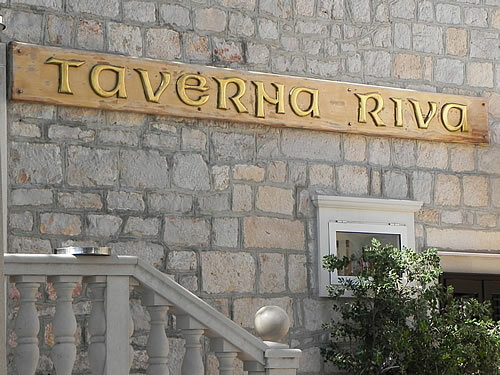 Taverna Riva – it’s lunch time! After art, it must be lunch time! We’d been recommended the Taverna Riva, which has a shady terrace overlooking the waterfront. 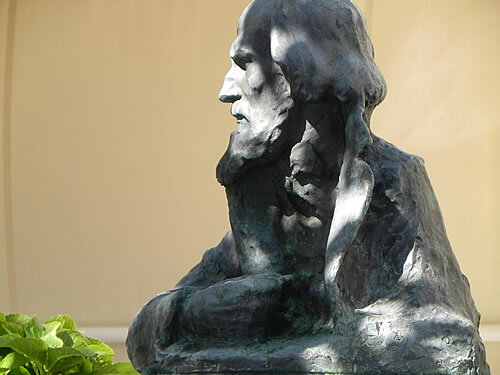 And at the back of the terrace is another fine bronze by Branislav Dešković – the People’s Tribune. His art is everywhere is this town, if you know to look for it! 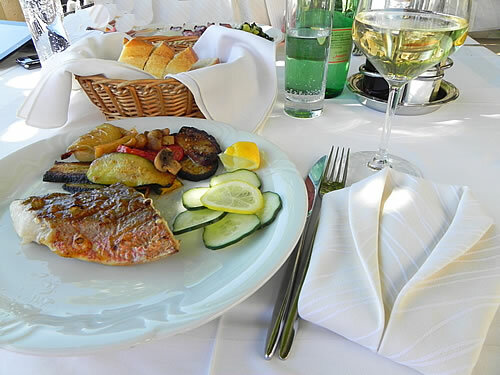 The food is freshly prepared and excellent – fish (zubatac) and grilled vegetables followed by walnut pancakes – yum! Our lunch is beautifully prepared and presented! We have front row seats for the ongoing show that is the busy harbour. A crowd starts to assemble below us, clapping and cheering as they look out to sea. What’s going on? 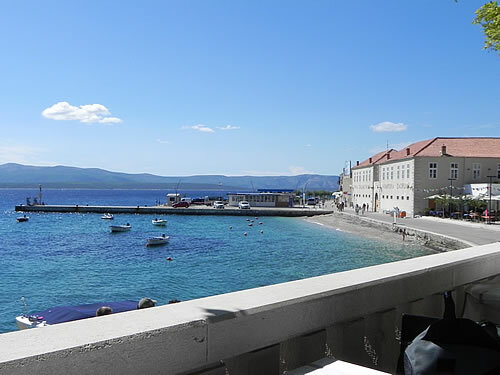 The waiter explains that it’s the finish of the Zlatni Rt to Bol swim race, a distance of about a mile along the coast. And yes, we can see a small boat coming round the pier, accompanying the lead swimmer. He’s followed by a few more hardy souls that actually complete the race, then there’s a ceremony. And the boats come and go in the harbour. 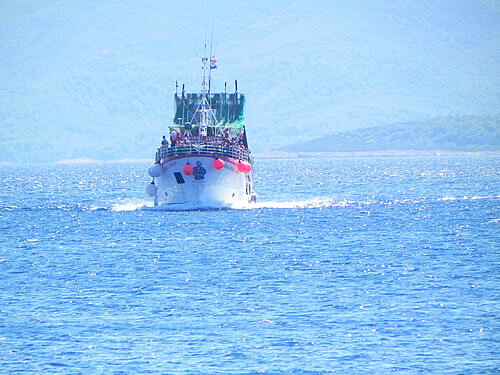 The Makarska pirate boat arrives from Hvar, complete with booming music. The coastal pirates are alive and well and still attacking the island towns it seems. I’ve seen this same boat in Jelsa and in Vrboska, and I’ve heard it from miles inland way up in the mountains. It’s LOUD, VERY LOUD. As it docks in Bol, the pirates announce in several languages that everyone should get off and board the taxiboat to the beach. Does everyone in town need to hear that, really? It’s blissfully peaceful again once the pirate tourists have sped off to the beach. We finish up our lunch in a contented glow amidst the dappled sunlight watching the sparkling blue of the sea. Did I mention that we had a glass of wine with our meal? We have a date this afternoon with Stina winery, and we thought to try it with food beforehand! Stina (previously known as Jako Vino) is a brand new winery, based in the lovely old wine cooperative building that we’d seen on the way into town. Sail-in wine tastings – what a great idea! Although they’re not yet harvesting their own grapes, that will be a year or two in the future, they already make some rather good wines from local cooperative grapes. I’ll cover the winery and their wines in more detail in a separate post, but for now I will mention that they are open for tastings every evening. 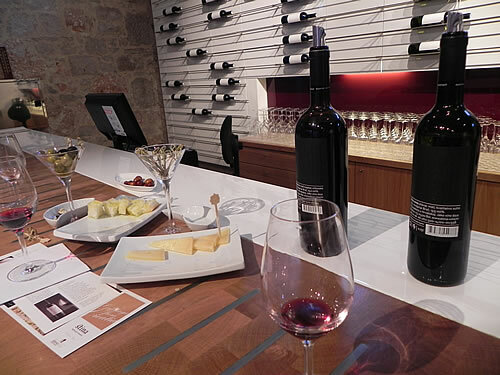 We emerged from our tour and tasting with a couple of boxes of wine. Just as well that we’re catching a boat home, and not driving! I will say in our defense that the wine was not all for us, we’d had a request from a friend to pick up a couple of bottles as it’s not generally available in shops. I’m sure that will change as they get better known, though!